Hi all, I have been painting and then stopping to play, I mean, create with paper. LOL You all know how I have fast become addicted to paper creations, altered art etc...well after visiting Astrid's blog and her post about designing this cute book card for a DT project, I had to make 1, well actually I am on the 2nd one in between painting and doing fiddly stuff. I had seen this book card idea before on someone else's blog earlier this year and I had copied the instructions which were in English so I am so happy that I saved them. Astrid will direct you to another site which does have a translator and very good visuals but I find being able to print off instructions and having them at the table really helps things zip along, when I need a pic to refer to then I just go look at the pics. Here is what I have done, I think these would be cute to put a few chocolates in and give as teacher gifts, Grandma from the kids, just a friend or......to put a matchbox in when you are doing a trade. Place it in a good little sturdy box or a bubble wrap and send off. I advise for the base of this you use a good sturdy card stock. You will be applying layers of paper and that will help but for the base of the card after doing my 2nd bird card I would venture to suggest using a sturdier paper. 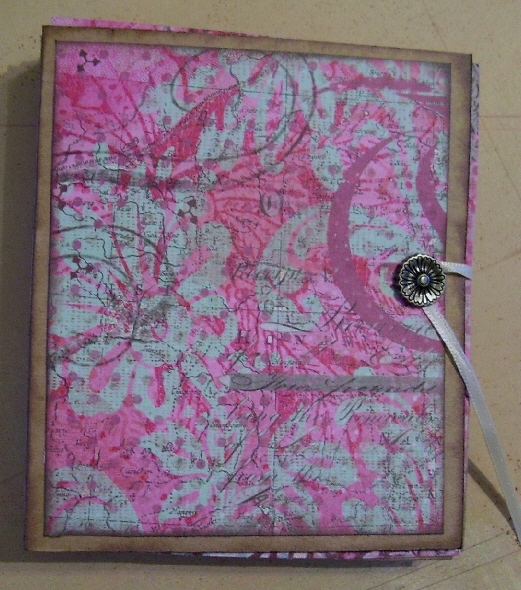 The first book card I made which is not complete here because I had no inspiration for pics at the time, I am still thinking but I think I know what theme I will finish it in, maybe a shabby, with flowers and flourishes and something really girly. 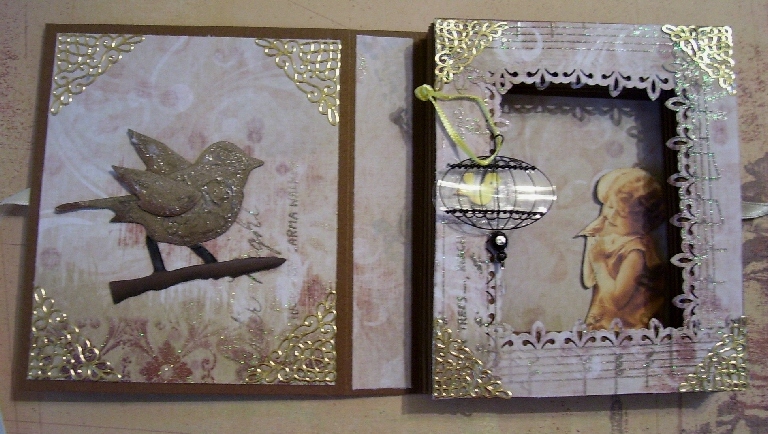 The bird theme here was inspired by the beautiful Bo Bunny paper I have had for ages, it is actually a holiday themed paper with music notes and glitter in the paper but it was a good backdrop for my bird theme. I am not sure now I like the bird cage I put in the inside, that might be removed and something else to replace it as I already removed it and the paper ripped a bit, hate when that happens. Oh and I must add, those cream coloured roses on the bird card, well I wanted to see what would happen if I dampened them, then dried them with the heat gun, I used tweezers so I wouldn't burn my hands holding the flowers, I just loved how the paper really crinkled and the edges of the roses almost got a burnt look to them. Again be careful doing this, I don't want to read how you burnt yourself and I didn't warn you. 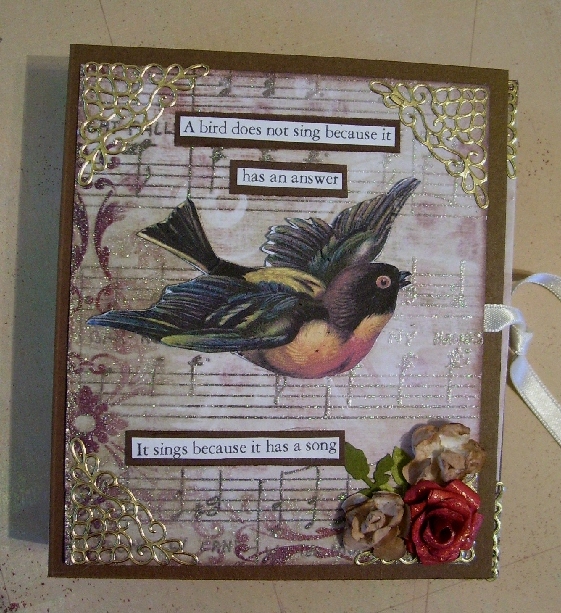 And...on the Tim Holtz's bird from his Alterations birdcage and bird die cut, I painted the bird in a tan colour, then used a bit of burnt umber to add a bit of depth and colour to accent. Then I applied clear crackle medium to it as I was going to just add a bit of charcoal to it after the cracking was finished. Well I used the heat gun again and got it to dry and bubble up and gave this really cool glassy knobby look to it. Click on the pic for a close up and see all the crunchy details. I love how things you don't expect happen. Just add to the fun and uniqueness to your pieces. Anyways thanks for dropping by, Just thought in case you were bored with my painting I would show some paper creations that I plan to try to sell when the shows start up. yikes this month is all the time I have left. The days are just flying by. If you need any help with this project email me or leave me a comment and I would be glad to share the English version with you. Love it and waht you did with the flower is terrific. If you haven't stopped by I'm having a Give-Away. These are beautiful book cards! wow, what a concept. Love what you have done with it. These are adorable! I must try one! 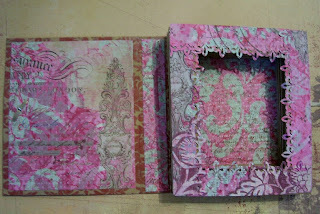 WOW- these are such a great projects- I love the book cards- it is so great that you show two different styles/colors too. Love the flower...! Beautiful book cards Les. Great project!!! Will make one soon!!! Your book cards are stunning Les, what fab creations! This is just lovely! what a designer's eye you have! And did you do some sort of over-dying or gelatin printing? It's delightful in its complexity and really worth looking at over and over again! In fact, I lik it that much, I find I'd really like to request a copy of those instructions in English, if it wouldn't be a bother. And Thank You for sharing this bright idea! I'd been looking for some inspiration for something a little more complex, and here it is! These are absolutely gorgeous. Love the window parts. Good luck at the shows! I did change the measurements, I used my ScorePal and wanted to score at 1/2 inch intervals to make it easier! Would love to have your English directions whenever you have a moment to send along!